Working on the ground to alleviate acute crises isn't something that just happens. In order to maximize its aid and assistance, SOLIDARITÉS INTERNATIONAL places great emphasis on commitment. > Working to implement a clear mandate by helping men, women and children who are hit by war, epidemics and natural disasters. > Delivering effective and appropriately targeted humanitarian aid directly to those in need, without discriminating against nationality, race, gender or religion. > Taking on key, demanding responsibilities, at HQ and on the ground. > Working with highly driven international teams, in often difficult circumstances and exposed to specific safety conditions and less than comfortable environments. > Ensuring that SI is an NGO with a personal touch, where your voice is heard and your efforts contribute to our impact on the health and lives of those who have lost everything. So come and live the Sol vibe with us! not just before you leave, but also throughout your mission and on your return. about your mission and we also give you honest feedback about your work..
but also because we know that difference is strength, we value the diversity of people and their pathways. and mentorship programs as well as technical workshops at HQ and in country. 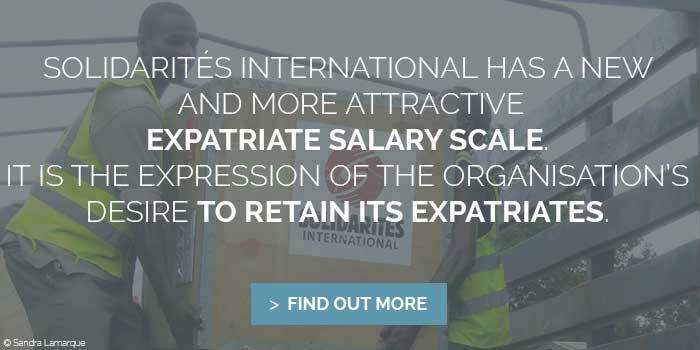 Because working with our organization means committing to a set of demanding responsibilities in often difficult situations, SOLIDARITÉS INTERNATIONAL has designed a special employment package (living conditions, salary conditions, custom individual support, etc.). He is responsible for activities relating to water, santiaion and hygiene.